RP make Geobags material is mechanically bonded nonwoven from ultra violet stabilized Polypropylene/Polyester Fiber. RP Geobag is used for protecting riverbanks and hydraulic structures from severe scouring and erosion. Geobags can be customized as per requirement. RP GEOBAGS material is mechanically bonded non woven from ultra violet stabilized Polypropylene / Polyester Fibre. 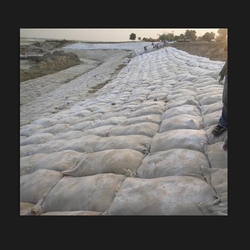 RP GEO BAGS is used for protecting riverbanks and hydraulic structures from severe scouring and erosion. Higher Resistance to ultraviolet degradation and biological & chemical environment normally found in soils. High abrasion resistance which provides reinforcement to the edge of the embankment. RP GEOBAGS considerably reduces the damage to the base embankment. The life of embankment increases exponentially. Stitching of the Geobags are done using High Tenacity Yarns.